Warhammer 40K Space Marine follows three space marines in their quest to halt the Ork invasion of the Forge-World Graia. The character you play as is Captain Tidus, followed by his right hand man Sargent Sidonis and the inexperienced/by-the-book marine Leandros. The Imperium wants the space marines to secure Manufactorum Ajakis, the manufacturing area of the Titan, an extremely large, robotic combat vehicles. That is the primary goal of the space marines throughout the game, but that is not all there is to the game. Towards the beginning of the game the space marines receive a distress beacon from Inquisitor Drogan. He is in need of help in the maufactorum, and states there is an ultra weapon there that needs to be protected from the Orks. The story takes off from there, following the distressing journey of the honorable Captain Titus and his war brothers. Throughout the game the player will come across new characters that may or may not be important to the story, as well as new settings and obviously new objectives. The game itself is roughly 10 hours in length, and felt very complete in that time frame. 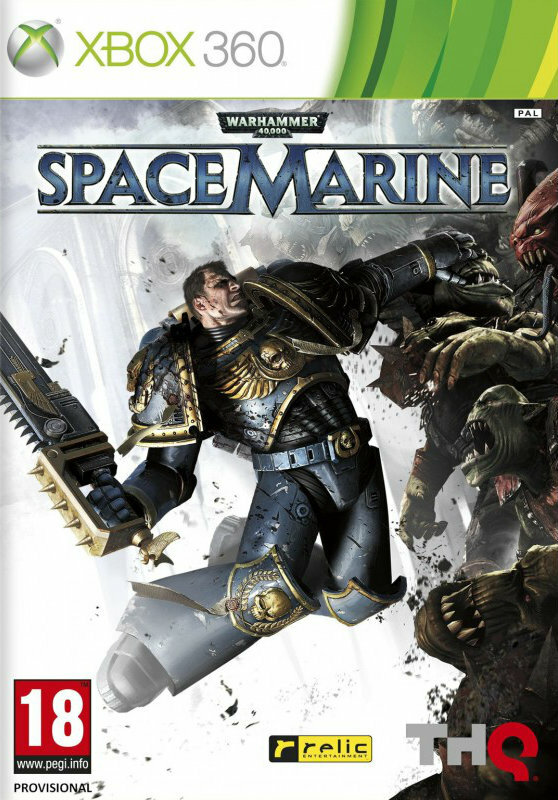 The gameplay is much like any third person shooter, but with hack-and-slash elements and a few added perks that come with being a space marine. You will have one melee weapon and four gun in your inventory throughout the game. The guns can be switched out with others as there are more than four in the game, and the melee weapon can be switched out as well. The guns range from pistols to laser guns, all having their own ups and downs. The four melee weapons you acquire throughout the game are the combat knife, chain sword, power axe, and thunder hammer; listed in order of availability and damage from least to greatest. There is a seamless transition between the melee hack-and-slash and the shooter aspects of the game, making the player have an easier time combining attacks with both melee weapons and guns. Health is gained by preforming executions on stunned enemies which proves to be very difficult in large enemy groups since there is no other way to gain health. There is a special ability in which power is gained by killing enemies, leading the player to unleash the power and attack with it. When in this mode the players health will be restored slowly and melee attacks are strengthened. This power is upgraded throughout the game to give the player more befits. The graphics of the game are decent, the game looks very nice and facial animation is very realistic. The color of the scenery is a bit drab, but believable for the planet the game takes place on and the situations the characters are in. There is gore and violence, so the player should expect blood and gore when killing the mass amounts of enemies. The soundtrack was not memorable, but was not bad. It fit the mood of the game well but was not something that was epic and stood out. The voice acting was very good, Captain Titus (voiced by Mark Strong) had a very memorable voice in which you could almost feel what he said, rather than simply hearing it. The writing in the game was good, very simple though. There are a few memorable lines, but other than those there is not much that is memorable in a good or bad way about the dialog. I found this game to be rather enjoyable, despite my initial dislike of it in the first 30 minutes. At first, I felt as if it was a bit boring and not unique at all. That feeling changed as I played on and realized that it was far from unique, and had a relatively interesting story to boot. I would definitely recommend pushing on like I did if you get stuck towards the beginning, mentally. Wahammer 40k Space Marine is a fun game worth playing through for any warhammer fan or general gamer. The game does have a multiplayer mode, which I originally planned on reviewing, but it does require and online pass and since I got this game through GameFly.com (which is an awesome service, if I may say so myself) and didn’t want to pay extra for the multiplayer. I never got to play the multiplayer but I figured no one would be on it anyways, so oh well. Thanks for checking out my latest review! I hope you like the new template for my reviews. nice review, I’ve just played the 360 version and am looking forward to replaying on PS3 (PSN+) for free after a break. Your review is very clear and inforamative, nice work. My only real criticism is the voice animations in that no ones mouth seems to move when in game and this can lead to who’s talking now? Thanks for the input, I’m glad you liked it!